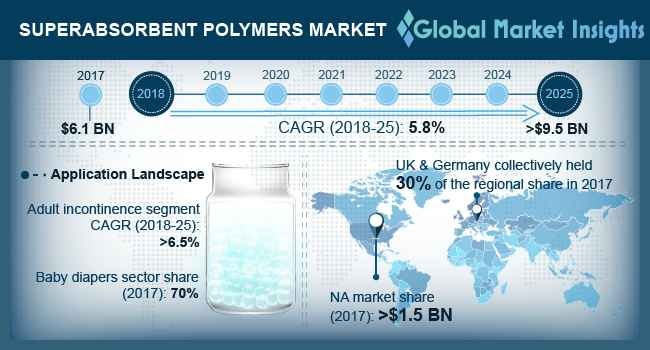 Superabsorbent Polymer Market size will surpass USD 9.5 billion by 2025; according to a new research report by Global Market Insights, Inc. Significant growth in hygiene industry has been driving the demand for superabsorbent polymer market. Rising health awareness and growing disposable income of people in emerging economies such as Asia Pacific have been contributing to the demand for hygiene products. Furthermore, superabsorbent polymer finds applications in wastewater treatment and paper packaging, which is also expected to add to the demand for these polymers in the market. Driven by such wide applications, the market is expected to witness significant growth throughout the forecast period. Superabsorbent polymer market from medical application will witness around 7% CAGR throughout the forecast period owing to increasing use of product in wound care dressing, and surgical pads. Moreover, technological advancements to manufacture antimicrobial and chronic wound dressing products will fuel the market throughout the forecast period.